We, a family of 4 spent one week end of December in the house which is rustic but nice with the pool, the patio, the wonderful view, the lemon and orange trees, the outdoor equipment and the weather (a bit cold though). The house is completely isolated which is very nice on one side but with some drawbacks on the other side that you have to be aware of. Indeed, you have to know that it takes 20-25 min to go to the first restaurant and 40 min to go to the first (small) supermarket with a crazy road. It takes 1 hour 15 min to reach the beach (which is very great, especially Los palomas) again via a road made of (at least) 350 turns. Despite the fact that the house is isolated, it was not quiet simply because of the continuous barking of a few dogs during the day and...during the night (but maybe we were not lucky). The final negative point was the temperature of the swimming pool: it never exceeded 20-21°C unlike what we have been told before the stay and during the stay (and despite the use of the "cover" during the night!). Anyway, the contact with Beatriz before and during the stay were extremely good and very professional. If you don't want to spent your vacation in a crouded area this is the place to be. Very quiet, beautiful area. A nice and clean house, with lost of space! The only thing we mist was wifi, in 2018 this is a must i think. Otherwise, we had a more than great week in this house! Lovely Location. Lovely small house, but that’s where our love of this property stops. Accommodation is of poor quality with old rickety furnishings. Kitchen utensils rusty, dirty or broken, same with cutlery, inadequate for self-catering. No oven or ironing board as stated in the property description. Lights not working, switches loose and wiring exposed on the iron and bedside lamp. The shower soap tray was broken resulting in a scratched arm. Towels threadbare and smelt musty. Neighbours dogs barked and screamed incessantly day and night. Absolutely the worst place we have ever stayed in. Not worth €816.20 we paid. We have asked for a €300 refund. The house was lovely and clean and the garden well kept and colourful. The area is suitable for a quite holiday and great for walking. We did not find any shops or restaurants near. So shop before you arrive and enjoy your time at the house. Beatriz was very helpful with the booking. 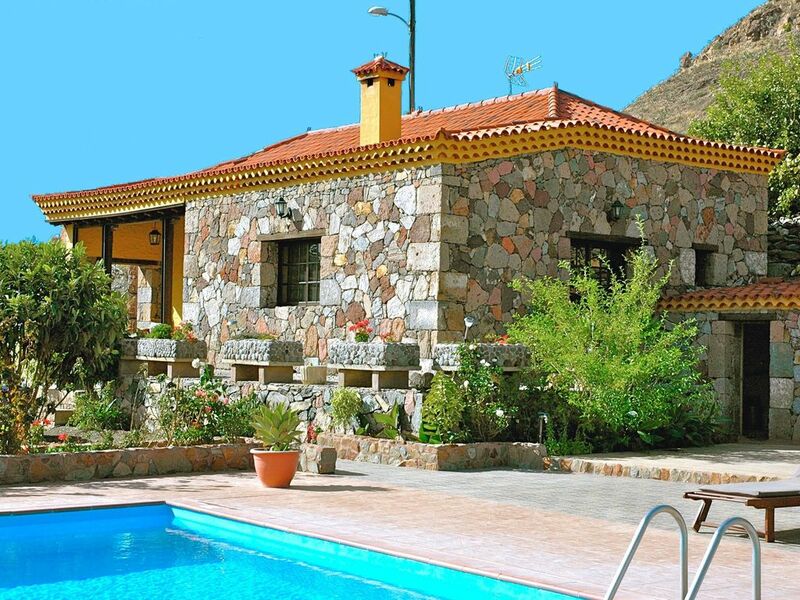 Wonderful remote house away from other tourists - perfect for a relaxing holiday! fantastic outdoor kitchen. Doing a large shop at the supermarket close to the airport before you arrive at the house is definitely recommended. There are small local shops around 15 minutes away, but with limited selection. All in all the perfect place for a relaxing holiday. If you like walking then this is the place to be! Most of the best walks on the island are within a 20minute drive of here. Stock up well on your way up as the supermarket is over an hour away. There is a good shop in Santa Lucia which is 25mins away. There are also a few good restaurants there as well. The house has a nice rustic feel about it and has a great outdoor BBQ / eating area. The pool was very welcoming on a daily basis, my only complaint would be the roller for the pool cover does not work very well so a lot of hard work and effort goes into removing it! La maison est située juste au-dessus d'une ville charmante qui est facilement accessible à pied le long d'une route de campagne et à proximité du barrage de Chira qui encourage même le plus paresseux de faire d'agréables promenades dans les environs. Le village possède une petite boutique et un bar, et seulement 6 km est toujours ouvrir le restaurant à La candelilla. Pour plus de services, la ville voisine de San Bartolomé de Tirajana est à seulement 15 km et il peut faire des excursions agréables à Tejeda, Ayacata, Artenara et manger dans les nombreux restaurants dans la région des plats typiques des Canaries, accompagnés par les jeunes du vin de Saint-Barthélemy. Pour passer une journée à la plage, à 30 km de Maspalomas et sont l'anglais et avec eux le golf Salobre et un parc aquatique. Autres activités: archéologique, extrellas vue splendide de la nuit.